Founded in 2003 by William C. Christie, M.D., The Surgery Center at Cranberry is a state-licensed, Medicare certified, privately owned surgical facility providing same-day, outpatient services to the residents of the Tri-State area. The Surgery Center is currently licensed to perform ophthalmology, gastroenterology, plastic surgery, oral and maxillofacial surgery, and podiatry. The Center occupies 10,325 square feet of space on the first floor which includes three operating rooms, two procedure rooms, one laser room, and 15 pre and post operative pods. The Surgery Center at Cranberry offers its patients a highly-skilled, board-certified medical staff, well-trained clinical staff of RNs, surgical technicians, and a supportive executive team, all dedicated to making a patient’s surgical experience safe and as pleasant as possible. Quickly gaining a reputation for technological advances and outstanding patient care, the Center has achieved a high rate of both patient and medical staff satisfaction. Always seeking to improve, patient concerns and suggestions are welcomed. Input from surgeons is encouraged. Building from the strength of partnerships, the Center has developed into a responsive, customer-focused healthcare facility. The Surgery Center at Cranberry considers it a privilege to participate in your care. Thank you for taking the time to visit our website. Why choose the surgery center? If you have talked to someone who has been toThe Surgery Center at Cranberry, you have probably heard good things already! But you may still be wondering, “Why choose a surgery center instead of a hospital?” You should know that choosing an ambulatory surgery center like the Surgery Center at Cranberry instead of a hospital benefits everyone – the doctors, the surrounding community, and most importantly, the patient! 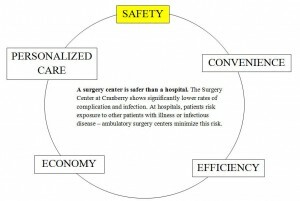 A surgery center is safer than a hospital. The Surgery Center at Cranberry shows significantly lower rates of complication and infection than hospitals performing similar procedures. At hospitals, patients risk exposure to other patients with illness or infectious disease – ambulatory surgery centers minimize this risk. Periodic audits confirm that the Surgery Center at Cranberry is compliant with the standards and regulations of both the Pennsylvania Health Department and the American Association for Accreditation of Ambulatory Surgery Facilities (AAAASF). Our AAAASF compliance is voluntary and further reflects our commitment to our patients’ safety. A surgery center is more convenient than a hospital. The Surgery Center at Cranberry enhances the patient’s comfort by focusing on the little things – free parking, quick and easy access, and complimentary refreshments in a clean, quiet waiting room. We also require less paperwork for admission and discharge, meaning our patients are in and out within a reasonable timeframe. 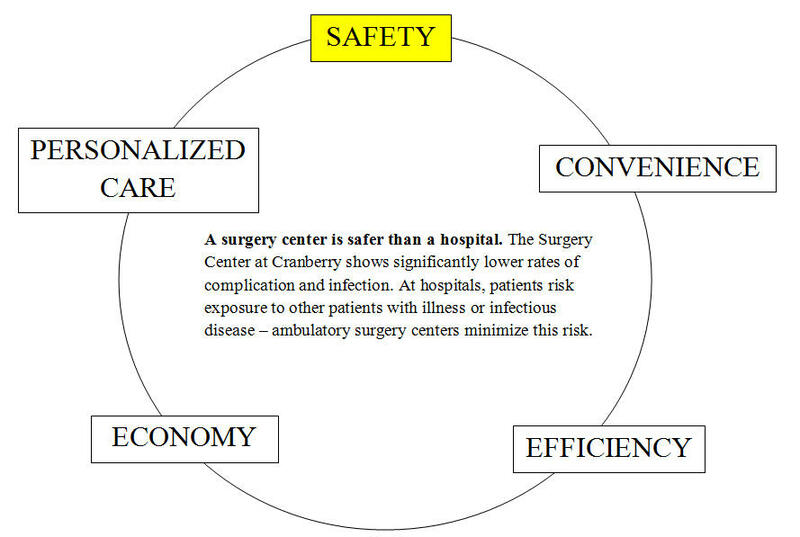 A surgery center is more efficient than a hospital. Because the surgery center focuses on a limited number of procedures and specialties, the staff is better-trained to assist in your specific procedure. Not only does this enhance your safety, it ensures that you will experience the most efficient care possible. A surgery center is more economical than a hospital. Because surgery centers incur less overhead cost than a hospital, they are able to offer their services at a lower price than hospitals. For example, in 2009, ambulatory surgery centers offered identical procedures at only 59% of the rates of hospital outpatient departments! Also, free market competition drives surgery centers to constantly improve their service; this allows patients to benefit from cutting-edge technology and top-notch personnel. Finally, unlike non-profit hospitals, the privately owned surgery centers pay local, state, and federal taxes that support the community and ultimately save taxpayers money! A surgery center is more personal than a hospital. More one-on-one care inevitably creates a more personal environment at the surgery center – by the end of their procedure, many of our patients know the staff members by name! Our team creates a surgical experience that is comfortable from beginning to end, whether that means thoroughly answering questions or offering a warm blanket. We take pride in knowing that some of our repeat visitors actually look forward to their surgery! 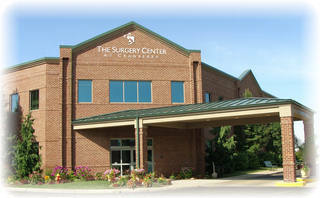 The Surgery Center at Cranberry believes in providing patients with the highest quality care. We offer our patients a highly-skilled, board-certified medical staff, well-trained clinical staff of RNs, surgical technicians, and a supportive executive team, all dedicated to making a patient’s surgical experience as safe and as pleasant as possible. The Surgery Center at Cranberry is evaluated annually by the Pennsylvania Department of Health to maintain its license to operate. The center is also held to higher standards by the American Association for Accreditation of Ambulatory Surgery Facilities, Inc. (AAAASF). Our evaluation by the AAAASF is voluntary and reflects our commitment to the highest standards of quality and safety. Thanks to a commitment to high standards of quality care, recent audits show that the Surgery Center at Cranberry is fully compliant with all standards set by both the Pennsylvania Department of Health and the AAAASF. Even before the Surgery Center at Cranberry was founded, Dr. Christie wanted to create a team of people that could comfort and serve patients as well as provide prayer at their request. Keith Thomas, a regional director for Search Ministries, did just that. After discussion with patients, staff, and doctors, Keith designed the Ambassador Program, which allows volunteers to fill the role of highly qualified “candy stripers” as well as offer spiritual support to patients. The volunteers are predominantly active senior citizens with a wide range of life experiences. Most of them know exactly what it is like to be a patient at the surgery center because they have been patients themselves. We can’t thank our Ambassadors enough for their service and for the kindness they have shown to our patients! If you are interested in learning more about the Ambassador Program or becoming a volunteer, please call Keith Thomas at 724-772-5640.